Title: old valve in the erie fueling racks. 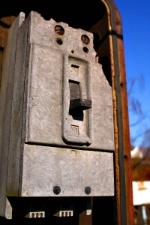 Title: Have no idea what this is, maybe an old metering system? Title: When was the last time this was used? Title: Was informed this was for the coal towers. 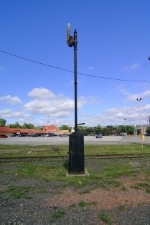 Title: Another shot of the historic Erie turntable. Its amazing how big this place was 30+ years ago. Description: Some minor rusting on this virtually brand new loco. Idling prior to departure. 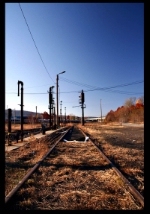 Title: Historic Erie Depot and Erie motel to the left. Description: Got the whole train in 1 shot with new wide angle lens. Title: Long ago this would've given the engineers passage or to stop. 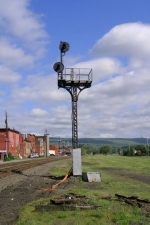 Title: Old and still used signal tower, seems to always be amber over red.